The professional qualification program of the Liberian Institute of Certified Public Accountants (LICPA) has produced four qualified professional Liberians accountants, Zeze Evan Ballah reports. A LICPA release issued in Monrovia, Liberia’s capital, Monday said this achievement is the very first in Liberia under the institute’s professional credentialing programs. The executive director of LICPA, James Dorbor Jallah, said based on results of the institute’s professional exams administered in November, the four candidates- Victor Tanwone of the Liberia Airport Authority, Mohammed Korleh of the Project Financial Management Unit, Ministry of Finance, S. Moses Kesselie, Jr. also of the Ministry of Finance and Raphael Quaye of the United Nations Mission in Liberia (UNMIL) were qualified as professional accountants. 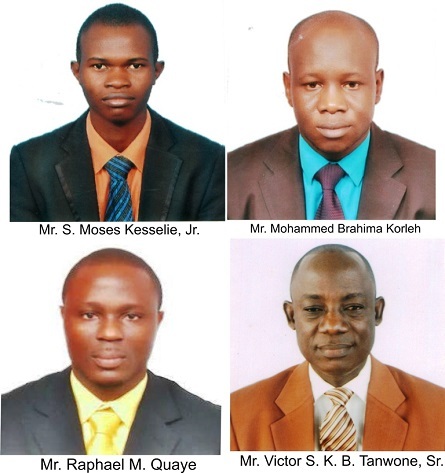 The four qualified professional accountants, according to Mr. Jallah, have completed part 4 of the institute’s professional exams. The release noted that the four successful candidates are now eligible for admission into the LICPA as Certified Public Accountants (CPAs) and also into the Institute of Chartered Accountants, Ghana (ICAG) as Chartered Accountants, Ghana, upon meeting the requisite experience requirements. Mr. Jallah said, to the best of his knowledge, this is the very first time ever in the history of Liberia that many local accountants have qualified as full professional accountants without travelling overseas for such professional qualification. The release also disclosed that two other LICPA candidates- Papin Daniels, senior assistant project accountant of the Public Financial Management Unit, Ministry of Finance; and Zinnah B. Sackie, finance manager at Aureus/Bea Mountain Mining Company have partially completed the academic requirements for part 4. The two are said to only have two papers to clear in order to also qualify as professional accountants. At the same time, the LICPA release said five other candidates have completed all requirements for part 3 of the institute’s professional exams and have now progressed to part 4 which is the final stage of the exams. The candidates include Booker Tendy Harris of the General Auditing Commission, Derek Amandu Hill, senior financial management officer, Department of Expenditure and Debt Management of the Ministry of Finance; Ade Wede Wee-Wee Kekuleh of the Liberian Institute of Certified Public Accountants, Anita Cece Wolo-Woiwor, audit senior of Panell Kerr-Forster (PKF) Liberia, and Samora P.Z. Wolokollie, senior staff auditor of Baker Tilly Liberia. These candidates are to join the two who have been referred in the final level of the exams. Mr. Jallah expressed optimism that this year local accountants will qualify as professional accountants. Meanwhile, LICPA President, Nim’ne Elliot Mombo, Sr. said he is pleased with the progress as far as the results of the exams indicate. Mr. Mombo noted that personally, he and the entire LICPA team, along with the people of Liberia are grateful to the United States Agency for International Development (USAID), which through its Governance and Economic Management Support (GEMS) program for Liberia, has, since June last year, provided funding for three experienced fulltime expatriate coaching instructors who prepared LICPA candidates for the November 2013 professional exams. The fourth instructor is expected to join those already on the ground in 2014. He also hailed the World Bank for its support in strengthening LICPA and praised the Government of Liberia for its continued support to the institute. A council member of LICPA, Tugbeh Doe, also said the national accountancy institutes in West Africa have taken note of progress made by the LICPA and have recognized the institute as the premier national accountancy body in West Africa that has consistently made significant progress in promoting professional accountancy skills in West Africa during the past five years. It can be recalled that in recognition of those achievements, the Governance Council of the Association of Accountacy Bodies of West Africa (ABWA) in May 2013 elected Mr. Mombo, current President of LICPA, as the representative of all accountancy bodies in West Africa on the board of the Pan African Federation of Accountants (PAFA), which is the continental arm of the International Federation of Accountants (IFAC), the highest standard setting accountancy body in the world.